The UC Davis School of Veterinary Medicine has achieved another milestone in clinical equine imaging with the first successful use of positron emission tomography (PET) on a standing horse. PET is a powerful imaging technique because it shows the activity of bone or soft tissue lesions at the molecular level. Equine PET, pioneered at UC Davis with the first horse imaged in April 2015, has until now required patients to be under general anesthesia. The ability to utilize this technology on a standing horse under sedation instead of anesthesia will greatly expand the availability of this powerful imaging technique, allow for more routine use, and open it up to patients that are not able to undergo anesthesia. The πPET scanner from Brain Biosciences, Inc. (Rockville, Maryland), a device originally designed to image the human brain, was used to produce the first equine PET images. A clinical program launched in August 2016 with support from the UC Davis Center for Equine Health (CEH) resulted in PET images of more than 100 horses. Data used for both research and clinical applications has shown PET to be particularly useful for detecting bone lesions that are not recognized using other imaging techniques, and to distinguish between active and inactive injuries in bone or soft tissue. For these studies, anesthetizing the horses provided easy access to the limbs and prevented motion, which could disrupt the final images. It remains the ideal approach to image multiple areas quickly and safely. However, general anesthesia adds to the cost, requires additional staff and equipment, and although rare, patients can have adverse reactions to anesthesia drugs. In order to develop a PET scanner specifically designed to address the unique needs of equine imaging, the PET research group at UC Davis, led by Dr. Mathieu Spriet, worked with the engineering team from Brain Biosciences, led by David Beylin and Pavel Stepanov. PET images are captured using detectors arranged in a ring. For standing PET, the clinician places the hoof of the sedated horse into the ring where the horse stands during the image capture. In order to image the horse limb from the foot to the knee, the ring of detectors needs to open freely to allow the horse to remove its leg from the instrument without getting hurt. Beylin and Stepanov have validated a mechanical design for such a scanner, and effort is currently on going to build this scanner. In the meantime, Brain Biosciences—through their LONGMILE division dedicated to orthopedic imaging—assembled a prototype that would allow initial validation of standing equine PET. The concept was to use the same full ring of detectors present in the πPET scanner, but to place it horizontally on the ground in a low protective shell. This allows for imaging of the foot, while at the same time keeping the ring low enough for the horse to safely step out of the scanner. 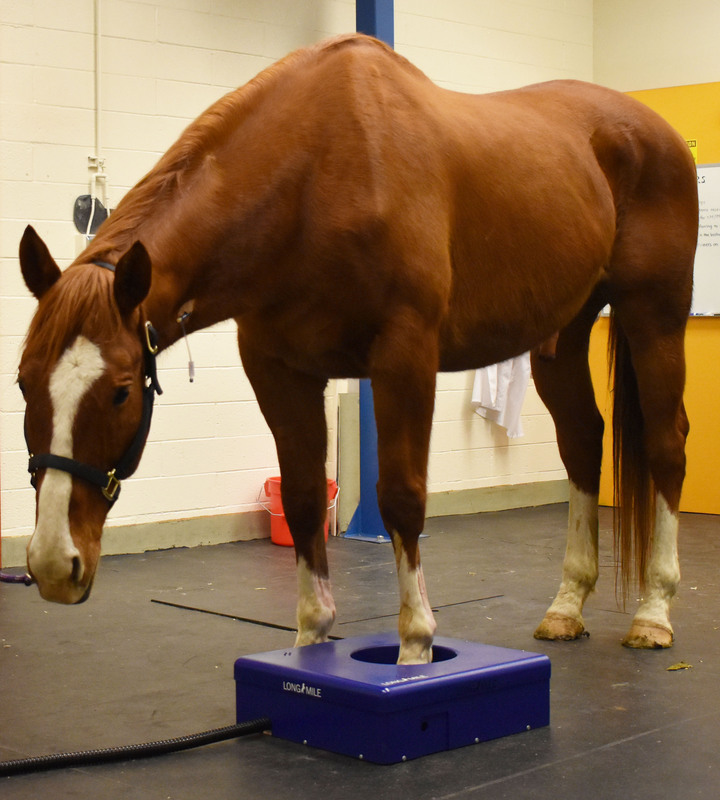 Image above: A 10-year-old Thoroughbred gelding from the UC Davis Center for Equine Health with a history of left front lameness stands in the prototype scanner designed specifically for equine imaging by Brain Biosciences. Two horses from the CEH research herd were imaged using this standing equine PET prototype for the first time on January 16, 2019 under the supervision of Spriet, with assistance from UC Davis equine surgery residents Drs. Jannah Pye and Bridget Nottle, and technical support from Rich Larson. Sedation of the horses was as simple as if they were undergoing a radiograph. The clinician positioned the front feet of the sedated horse in the center of the ring of the scanner, one at a time (Image 1 above). High quality PET images, presenting 3-dimensional information, were captured within five minutes for each foot (Figure 2). Images were obtained on two consecutive days using the two most common PET tracers for equine imaging, the 18F-Sodium Fluoride (bone tracer) and the 18F-Fluorodeoxyglucose (soft tissue tracer). The entire procedure went smoothly, and the data collected confirmed the ability to acquire PET images of the equine forelimb in standing patients without compromising image quality from motion artifacts. Another important goal of this initial imaging session was to measure the radiation exposure to staff. Radiation measurements showed that the dose received by the staff was no higher than for scintigraphic bone scans, which are commonly performed in horses, thereby confirming the safety of the procedure. Image 2 above: Lateral and Image above: Dorsal 3D 18F-NaF (bone tracer) PET images of the left front foot obtained without anesthesia. The yellow area indicates marked active remodeling within the navicular bone. Removing the need for general anesthesia should make PET available to more patients. It will also avoid interruptions to the training program that would otherwise be required while the horse recovered from the procedure. Another important application will be for laminitis evaluation. Preliminary data has shown that PET is valuable in the assessment of laminitis, however, laminitic patients are not good anesthesia candidates. Positron emission tomography of the equine distal limb: exploratory study. 18 F-sodium fluoride positron emission tomography of the equine distal limb: Exploratory study in three horses.Spriet M, Espinosa P, Kyme AZ, Phillips KL, Katzman SA, Galuppo LD, Stepanov P, Beylin D.